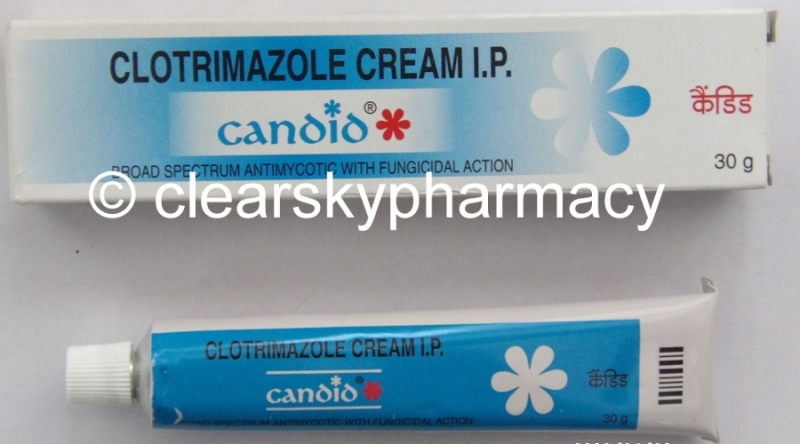 Clotrimazole Topical Cream (Candid 1%) is an effective OTC medicine to treat skin Yeast infections such as athlete's foot, jock itch, ringworm, and other fungal skin infections (candidiasis). This medication is also used to treat a skin condition known as pityriasis (tinea versicolor), a fungal infection that causes a lightening or darkening of the skin of the neck, chest, arms, or legs. Clotrimazole 1% topical cream is an azole antifungal that works by preventing the growth of fungus. Candid Cream is manufactured by Glenmark Pharmaceuticals Ltd. in the strengths of 1% and packed in a 30 gm tube. 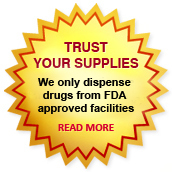 We also have in stock Forcan (Fluconazole tablets) which is also used to treat yeast and fungal infections. We supply original Candid 1% Cream manufactured by Glenmark Pharmaceuticals Ltd. The active ingredient present in Candid Topical Cream is Clotrimazole. Candid Cream 1% is supplied in 30 gm tubes, in a box. Each gm contains 10 mg of Clotrimazole in vanishing cream base. 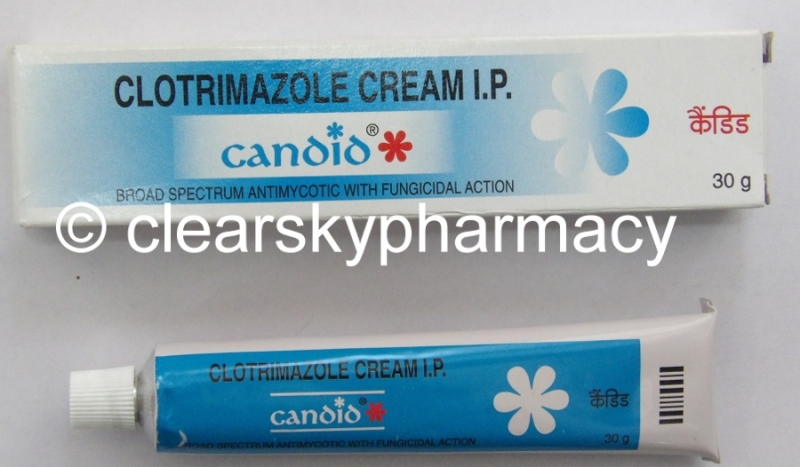 Clotrimazole topical (Candid antifungal cream) is an is a broad spectrum anti-fungal medication that fights infections caused by fungus. The most common fungal skin infections include athlete's foot, nappy rash, sweat rash and ringworm. The two main types of fungal infection include The tinea group (also known as dermatophytes) and the candida group ( also known as yeasts). Candid 1% OTC Cream (Clotrimazole Topical Cream) is used to treat skin infections such as athlete's foot, jock itch, ringworm, and yeast infections. Use Generic Clotrimazole Cream on the skin only. Clean and thoroughly dry the area to be treated. Apply this medicine to the affected skin, usually twice a day or as directed by your doctor. Dosage and length of treatment depends on the type of infection being treated. Do not apply this more often than prescribed. Your condition will not clear faster, but side effects could be increased. Apply enough medicine to cover the affected area and some of the surrounding skin. After applying this medication, wash your hands. Do not wrap, cover or bandage the area unless asked to do so by your doctor. Use Candid 1% OTC Cream (Clotrimazole Topical Cream) regularly in order to get the most benefit from it. Remember to use it at the same times each day. Continue to use this medicine until the full prescribed quantity is finished, even if symptoms go away after starting Clotrimazole topical OTC cream. Stopping the medication too early may allow the fungus to continue to grow, which may result in a relapse of the infection. Apply Clotrimazole topical cream in a quantity sufficient to cover the affected area and immediately surrounding skin twice a day for 4 weeks, depending on the nature and severity of the infection. Apply Clotrimazole topical cream in a quantity sufficient to cover the affected area and immediately surrounding skin twice a day for 2 weeks, depending on the nature and severity of the infection. Apply Clotrimazole topical cream in a quantity sufficient to cover the affected area and immediately surrounding skin twice a day for 4 to 8 weeks, depending on the nature and severity of the infection. Apply Clotrimazole topical cream in a quantity sufficient to cover the affected area and immediately surrounding skin twice a day for 2 to 4 weeks, depending on the nature and severity of the infection. What happens if I miss a dose of Candid 1% Cream? Store Candid 1% Topical Cream at controlled room temperature below 25°C in a cool, dry place. Do not store in the bathroom or near a sink. Do not leave it in the car or on window sills. Heat and dampness can destroy some medicines. Keep Candid Cream away from children. Candid 1% Topical Cream is contraindicated in patients with a hypersensitivity to Clotrimazole or any inactive ingredient present in Candid 1% Topical Cream. Use Candid 1% topical cream for the full treatment time even though the symptoms may have improved. Notify the doctor or health care provider if there is no improvement after four weeks of treatment. Inform the doctor if the area of application shows signs of increased irritation (redness, itching, burning, blistering, swelling, oozing) indicative of possible sensitization. Avoid sources of infection or reinfection. Clotrimazole topical cream side effects have included erythema, stinging, blistering, peeling, edema, itching, burning, and general skin irritation. Contact dermatitis, confirmed by patch testing, has been documented. Skin rash, hives, blistering, burning, itching, peeling, redness, stinging, swelling, or other sign of skin irritation not present before use of this medicine. Acute overdosage with topical application of Clotrimazole (Candid 1% Topical Cream ) is unlikely and would not be expected to lead to a life-threatening situation. Clotrimazole topical cream (Candid 1% Yeast Infection Treatment) has been classified by the US FDA as Pregnancy Category B. Systemic absorption is minimal following topical or vaginal administration. Animals given high doses intravaginally have not revealed evidence of teratogenicity. High oral doses resulted in embryotoxicity and maternal toxicity. In clinical trials involving women in their second and third trimester, clotrimazole treatment of vaginal candidiasis was not associated with fetal harm. Clotrimazole use has not been well studied during the first trimester. Clotrimazole should only be used during the first trimester when the need has been clearly established. Do not use this medicine without your doctor's consent in case you are pregnant. There are no data on the excretion of Clotrimazole into human milk. However, systemic absorption is minimal after topical and vaginal administration. Caution must be used when administering Clotrimazole topical to nursing women. Do not use this medication without telling your doctor if you are breast-feeding a baby. You can buy Generic Clotrimazole Topical 1% Cream online from Clear Sky Pharmacy at a cheap price. Candid 1% Cream which is an OTC Yeast infection treatment, manufactured by Glenmark Pharmaceuticals Ltd., India is supplied in 30 gm tubes, in a box. The 30 gm tube cost only $5.50 per unit when you place an order for 20 tubes.